So I have a reputation. In my family it is well known that if you invite me to your wedding, and you play music at said wedding, I will dance like my chicken Marsala was sprinkled with “funny” mushrooms instead of shiitakes. I like to sing all the songs (the more 80s and cheesy the better). I use random objects as microphones and when no random objects can be found, I use my fist. 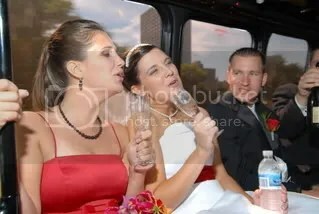 I act out the words (seriously, if you have snooty family to impress, don’t play Pour Some Sugar On Me at your reception). I tend to get a lot of comments like, “Wow. You’ve got a lot of…energy.” Which is exactly the sort of thing people say about four-year-olds when they can’t think of anything nice. At weddings where I’m not around people I’ve known since birth and no one else is dancing, I’m actually much more reserved (though it takes a whole lot of will power and I can’t help but bop my knees under the table). But really, what’s a wedding without dancing? Receptions are practically the reason the song Footloose was written. And then he went on to demonstrate that while dancing, I’m the facial equivalent of Elaine from Seinfeld. At first I was mortified. Dancing is one thing. But stupid facial expressions? Was everyone laughing at me? And I tried so hard to dance without making the faces after that, but it was impossible. Like trying to sneeze with your eyes open. My facial muscles seem to be connected to my leg muscles, which are all hardwired to move to the beat. I imagine the face is not unlike this. With or without a baby in my arms. No surprise, this picture was taken at a wedding. So. Whatever. I embraced it. I danced and I made stupid faces and it was OK. Because why should something I can’t control dictate my enjoyment? Plus, I figured it’s been this way for years and it all fits into that whole “endearing quality” theory I talked about before. And then I danced some more. And did the Thriller with my grandma. Because my grandma is awesome. And she makes silly faces too. And she’s in her 80s and isn’t afraid to try doing the Thriller. When I grow up I want to be just like her. I’m sure there’s a moral in there somewhere–Dance like no one’s watching. Or embrace who you really are. Do with it what you will. I just figure that somewhere along the way, someone isn’t going to like what I do/say/think no matter what it is. So I might as well make sure that what I’m doing/saying/thinking is all me. After all, Elaine is a pop culture legend. Tags: dancing, Def Leopard, Elaine, Footloose, Kevin Bacon, Michael Jackson, music, Pour Some Sugar On Me, Seinfeld, Thriller, Weddings. Bookmark the permalink.